If you’ve been keeping up with things around here, you might have seen me profess my undying love for Ottawa recently. Only second to that is my love of the Ottawa Farmers’ Market. Tent upon tent, aisle up aisle of vibrant produce, some of which is a downright mystery to me, alluring pies and baked goods, candy-like jars of golden honey, local & ethically raised meats, tiny pots of aromatic herbs, beautifully carved wooden utensils and home goods… it’s a feast for the eyes as much as the tummy. Since it’s becoming increasingly harder for me to stay away from Brewer Park, I’ve partnered up with the Ottawa Farmers’ Market in something we’re calling “Farmers Feast”. In this feature, we aim to explore all that the Ottawa Farmers’ Market vendors have to offer and ways to make use of all the wonderfully local ingredients being sold. Vendors will be providing me with some of their wares and I’ll be cooking up a storm with them and sharing the recipes with all of you – in hopes that you’ll do the same! Or at the very least, be inspired to visit the market and see what else they have to offer. Included in the basket; intensely hued Blue Cabbage from Jambican Studio Gardens, delicate Pea Sprouts from Roots Down Organic Farm, tender, incredibly flavoured Gourmet Elk Steaks from Elk Ranch, luciously sweet Chocolate Honey from Ottawa Valley Honey, tiny succulent strawberries from Avonmore Berry Farm (life changing. seriously. ), curly, pungent Garlic Scapes from Acorn Creek and, perhaps my favourite, colourful bundles of crispy radishes with vibrant green tops and a bag of peppery, biting arugula from Rainbow Heritage Garden. 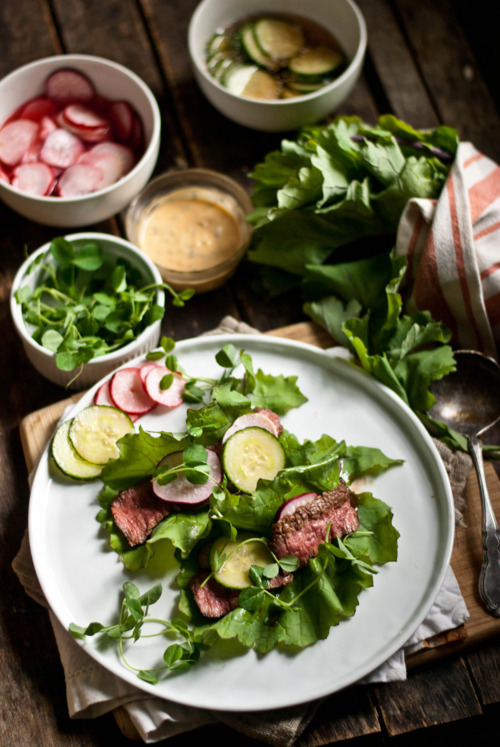 I really wanted to share a recipe that showcased the remarkably fresh flavour of the greens as well as the beautiful elk steaks. And so I did just that! If you’re unfamiliar with Elk, fear not, it’s much like steak in texture and flavour but has a slight gamey kick. Certain marinades can take care of that gamey flavour, but I don’t find it deters me at all – it’s the flavour of local meat! 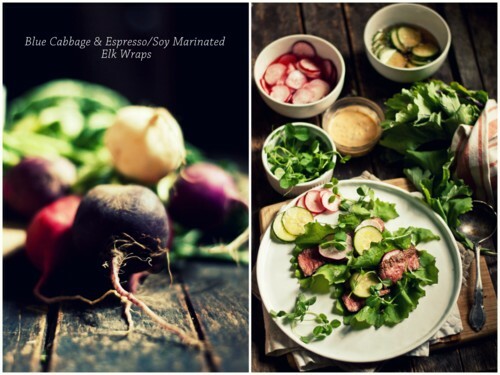 These wraps make a wonderful “this’n’that” meal. Place all the components on the table and let everyone put a little of this, a little of that into their cabbage wraps. In a Tupperware container or Ziploc bag, add the espresso, soy, olive oil, garlic and steaks. Place in the fridge and let soak for at least 1 hour. Elk is incredibly lean and is best served rare to medium-rare so keep that in mind when you’re searing up your steaks. 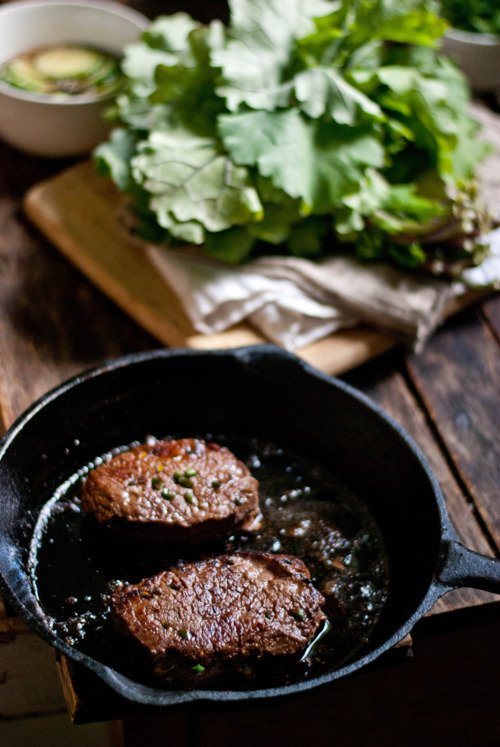 In a heavy, cast iron pan – add 2 tbsp olive oil and heat over medium-high heat until shimmering. Remove the steaks from the marinade and pat dry. Add them to the pan along with the butter and let sear for 2-3 minutes on each side, just until golden. Flip and cook the other side for 2 minutes. Remove from pan and cover with tin foil to rest for 5-10 minutes. Once rested, slice thin to serve. I put these in separate bowls, feel free to put them together to save on dishes. Pour the sugar and warm water into a bowl and stir until dissolved. Add the vinegar and salt. 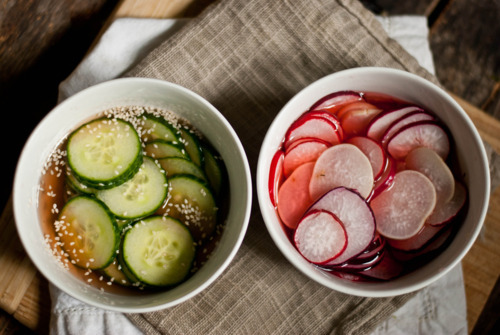 Slice the radishes and cucumbers into thin rounds and add to the brine. Sprinkle with about 1/2 tsp sesame seeds. Let them soak until ready to eat. 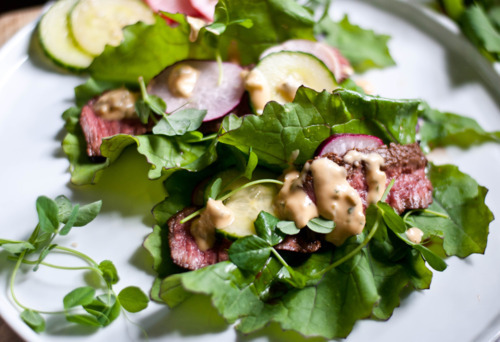 Place the blue cabbage leaves on a platter along with the sliced steak. 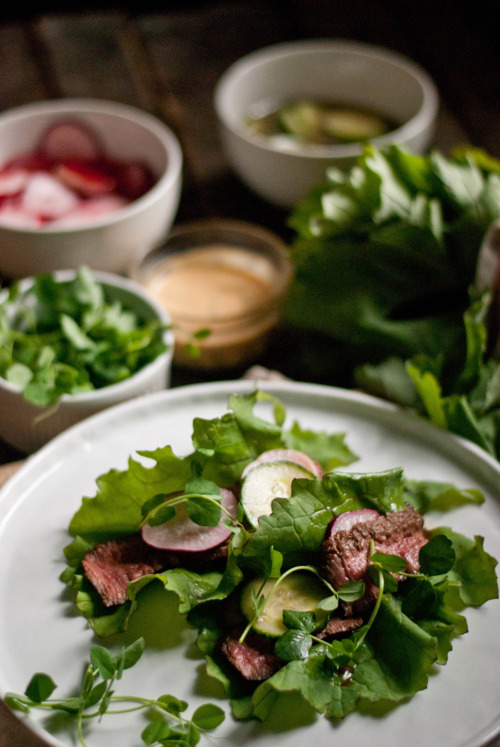 Provide bowls of pickled veg & pea sprouts. Let everyone put their own wraps together, eat and enjoy!